Some other changes, specific to Discipline, are: Divine Aegis no longer grants Power Word: Shield a chance to crit, Pain Suppression no longer reduces the target’s threat, Evangelism no longer affects the damage or mana cost of spells, Spirit Shell is now a level-75 talent, replacing Divine Insight for Discipline Priests, Holy Nova is no longer available through a Major Glyph, and is instead a Discipline specialization spell gained at level 20. You can see all of the Priest changes in our Priests and Warlords post. This guide is intended for the raiding Discipline Priest. If you’re looking for PvP, leveling, or the other specs then see the links in the “contents” section. 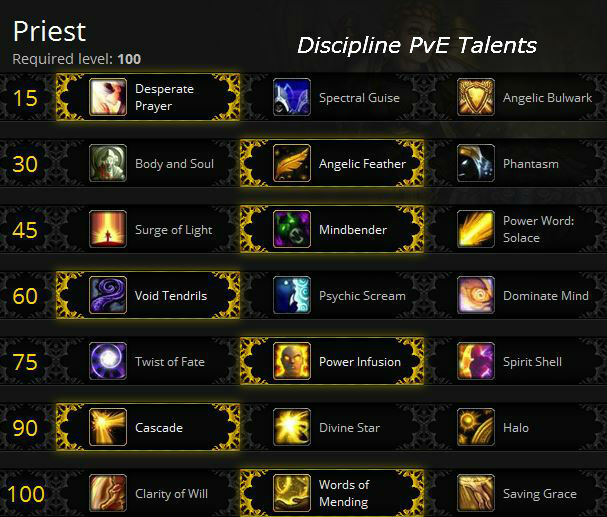 This Discipline Priest guide is primarily intended for use at level 90. However, the principals will still apply during the leveling process. If you’re looking for advice on leveling your Priest, check out our Priest Leveling Guide. The selected talents are an overall good pick, but there will be times when you want to switch them around. With the proving grounds it will be easy to test new talents and glyphs. Our picks are checked: . Descriptions are below the image. Angelic Bulwark shields us when we drop to low health, an alternative method of survivability to Desperate Prayer. Angelic Bulwark might beat out Desperate Prayer on fights where you expect to drop to low health more often than Desperate Prayer can be of use. It’s also a passive ability, you don’t have to be concerned about hitting a key. It doesn’t help if you’re already near 30% and the next hit takes you all the way down, but then, neither does Desperate Prayer. Body and Soul adds a nice speed boost to our Power Word: Shield. If your targets of PW:S typcially also need the speed boost, then this is your pick. If the target is in a group that had to stay together while kiting whatever, then they might get annoyed with you. Angelic Feather is ideal for providing on demand speed boosts to one player at a time. Very flexible. Not as expensive to cast as Power Word: Shield (under Body and Soul,) but requires proper placement and it’s easy for the wrong player to trigger it, especially when they’re stacked up. But then again, in those situations you probably won’t be using it on them anyway. Surge of Light – If you’re just healing and your mana is fine then take this one. Twist of Fate is a damage and healing boost that’s best taken for encounters where you expect to be throwing out emergency heals to low health targets on a frequent basis. Cascade operates best when your raid is somewhat spread out and needs periodic healing. Less expensive than Halo. Can pull a lot of adds it you target an enemy. Divine Star is a cheap heal with a short cooldown. Best if your raid group stacks up or forms small, tight groups. It can pull adds if they’re too close or you miss. Prayer of Healing is better than Divine star, to skip this one. Clarity of Will: Give the target a big shield for 20 sec. Longish cast time. This is the best single target choice. Words of Mending: Heals and shields grant you stacks of “Word of Mending.” At ten stacks your next direct heal or shield also casts Prayer of Mending at the same target. Nice choice if you’re doing area healing, and since you’re likely doing just that this is the pick. Saving Grace is not a good choice for most situations. You instantly heal a friendly target for a big chunk of their max health, but your healing done to that target is reduced by 10% for 8 seconds and this stacks up to ten times. Cast this one a few times and you won’t be doing much with any heals. Might be worth it in some situations, such as when you need a big heal right now” and can afford the lessened heals afterwards. As with talents, your glyphs can be changed any time you like. These are ordered more or less by importance, but that will change depending on exactly what YOU are doing and what you’re fighting. All the other glyphs must be obtained in the usual manner. Glyph of Penance – Required if you need to cast Penance while moving, but it increases the mana cost of Penance. Glyph of Weakened Soul has use if there are several D Priests in the raid. If you’re bumping into Weakened Soul problems then this is pretty much mandatory. Glyph of Prayer of Mending – Your primary target gets the bigger heal, though it decreases overall healing. Glyph of Holy Fire – Increases the range of useful spells by 10 yards. Glyph of Power Word: Shield – Converts some of the shield absorb into healing. Glyph of Purify – Your dispell also heals the target for a small amount. Glyph of Smite – For those who are into smiting. Does more damage but that damage does not carry through Atonement, which makes this glyph less useful. Glyph of Fade – adds a small amount of damage reduction when you Fade. Very nice in 25s. Glyph of Inner sanctum – reduces damage and increased movement speed. Glyph of Levitate – movement speed increase while levitating. Glyph of Mass Dispell – let’s you dispell the undispellable. Glyph of Holy Resurrection – Your target is bathed in Holy Light. Glyph of Confession – A friendly target can be compelled to tell you a secret. Great for blackmail opportunities. In Warlords of Draenor Hit, Expertise, Resilience, PvP Powere and Reforging are all dead. Int no longer adds to Crit, but you start out with a 5% base Crit rating anyway. Spirit affects your mana regen and will be your most important stat until you are happen with your mana usage. Once that’s Ok you can start working in the other stats. Crit – A commenter says, “Divine Aegis doesn’t just come from prayer of healing. It actually procs on critical heals. Instead of healing 200%, you get 100% heal and a 100% shield. High crit disc priests are a viable build.” PW Shield is also affected by Crit, but not by Divine Aegis. Mastery and Crit are more or less equal, depending on your spell usage. Make note of which spells you’re actually using all the time and experiment a bit. Look at your healing meters, mana usage, and how people are surviving. Experiment a bit until you have a good plan.Mastery and crit play well with each other. You should prioritize Crit, but keep Mastery close. Haste has been tweaked in Warlords, along with appropriate abilities, with the intent of removing the need to hit breakpoints. So adding X amount of Haste at any given level should be more beneficial than before. It speeds up your casts, how fast your HOTs tick, and so on. It also helps you burn mana faster. Multistrike gives you a chance for an addition one or two hit on any given heal or attack. These hits can crit. Versatility adds to your healing, damage, and your damage reduction. You have certain useful abilities, in addition to your heals. Keep in mind that buffs do not stack with similar buffs that others bring to the table. Power Word: Fortitude: +10% Stamina to the entire party. This also gives you a brief 40% Haste Boost from all Haste sources. You also get the same effect from PW: Shield, which you’ll be using a little more often. Fear Ward:the next fear against the target will fail. Purify: Removes all disease and magic effects from an ally. Dispell Magic: Removes a useful magic effect from the target. Mass Dispel: Does the same, but to a 15 yard radius and removes harmful effects from your pals. If glyphed it also removes an otherwise undispellable effect. Spirit Shell (1 min CD) if you took it can be used to build up an absorption effect on your target if you anticipate them suffering a heavy amount of damage. Power Word: Barrier is a raid defensive cooldown best used when your raid is stacked together so they can all benefit from the damage reduction effect. Pain Suppression is another survivability cooldown you should generally save for use on a tank in advance of heavy damage although it can also be used in emergency to save anyone who requires high damage mitigation. Shadowfiend (from your Mindbender talent, if you took it) should be used on cooldown for extra mana regeneration and a minor amount of DPS. Penance on the tank, or a secondary target, and as it recovers from cooldown. Power Word: Shield on the tank or other target needing it. Using this ability will trigger Borrowed Time which adds 15% spell haste to our next spell cast, this buff lasts for 6 seconds. Prayer of Mending on the raid. It should be applied to a target at all times as it will jump to other players as they take damage. Heal as needed. It has a very low mana cost but a moderate cast time and healing effect. Use this as much as possible to conserve mana. Flash Heal is faster to cast, but requires more mana. Save it for when that faster cast is more important than the mana cost. Apply Renew to your target if Prayer of Mending is unavailable and they have Weakened Soul and therefore cannot have Power Word: Shield cast on them. When AoE healing you will primarily be using Prayer of Mending, Power Word: Shield, and Prayer of Healing. Prayer of Healing applies the Divine Aegis effect to everyone you heal with it, granting them additional survivability and should be cast as often as is necessary as well as perhaps prior to a period of heavy damage to build up the absorption effect of Divine Aegis. Holy Nova is useful when the raid is taking less damage and/or you have to move around. Atonement healing requires that you damage enemy targets to heal your allies as Holy Fire, Smite and Penance will heal a nearby friendly target within 15 yards for 100% of the damage dealt. You, the caster, will only be healed for 50% as much. Evangelism stacks build up when you deal direct damage with Penance, Smite or Holy Fire, stacking up to a maximum of 5 times. Each stack increases the amount of damage done by your Penance, Smite and Holy Fire spells by 4% and reduces their mana cost by 6%. Archangel consumes all your stacks of Evangelism, increasing the effectiveness of your healing by 5% for each stack consumed for 18 seconds. Surge of Light procs will allow you to instantly cast Flash Heal with no mana cost. The charges of this proc stack up to a maximum of 2 times and so should be used as often as possible to avoid wasting charges. Mindbender simply enhances your Shadowfiend and is best used if you need the mana. Dump it when your mana regen is fine without it. Power Word: Solace can be used for damage and extra mana regeneration. This covers the basics of D. Priest healing and is dungeon oriented. Clear and pretty short. Your Priest bonus adds to any Int gem bonuses, making them worth 5% more Int, that bonus does not add to other stats. Note that there are no Int gems for Warlords gear. In pre-Warlords gear Gemming should be for Spirit first, until you can last an entire fight without running out of mana. Running low during or at the end of a fight is fine, running out is not. Gem and gear appropriately. In Warlords there are no Spirit gems. Before level 91… gem for Int and Crit/Mastery. Meta socket: if you can get the legendary quest then grab either legendary gem that best fits your needs, though Courageous Primal Diamond is suggested. It will save you a lot of mana and you might even be able to drop the spirit gems. Otherwise Revitalizing Primal Diamond will help with your mana and Burning Primal Diamond will help with more powerful heals. Gems sockets are actually few and far between. They have a (small) random chance to appear on level 100 gear. Also, there are no meta gems or sockets, there are no socket bonuses, and all sockets are “prismatic,” which means that they will take any available gem. Older (Mists of Pandaria) gems work until item level 600, but the item squish cut them down a bit. What used to be 160 Int is now 10, for example. The new Prismatic gems are 50 points of Crit or whatever. 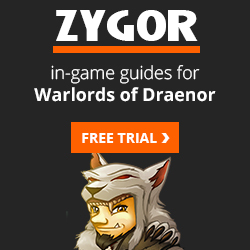 In Warlords you should gem for Crit. Warlords Notes: There are no head enchants, all shoulder enchants come from the Inscription profession and are only for items under items level 600. There are new enchants for Neck, Cloak, Weapons, and your Rings. Not for any other pieces. (Not yet, anyway.) Like your gems, none of the new enchants (so far) provide Int, they are all secondary stats. Enchant for Crit. There is a weapon enchant for Spirit if you need that. All food buffs last one hour and disappear if you die. Pandarens get twice the food buff. Even the gathering professions have some value, though you might be better served by using those to build a larger gold stash. Professions now are for the gear and/or the gold. Most have something that can be used as starting raid/pvp gear or sold, such as ilevel 640 gear pieces. Leveling a profession can be done quickly and relatively easily once you get the Draenor version. As far as gear goes you might be better served by using those to build a larger gold stash. Engineering has lots of interesting toys, some of which have situational use. Tailoring Cloth armor, flying carpet, murlock chew toy. Since Cataclysm all of the WoW races can be Priests, except Orcs. Yes, even Pandarens can be Priests. In Warlords this doesn’t change. Most of the racial abilities will make very little difference in the end-game. If a Gnome or Goblin works for you, then go for it. If you want some extra burst then go Orc, if you want that escape ability for PvP then go Human. Want to just look gnarly? Undead or Worgen. Warlords of Draenor does away with any racial abilities that had Hit or Expertise. It also added a few new abilities. Trolls might be the best pick due to their Berserking racial and snare resistance. Arcane Torrent restores some mana and silences casters, but you won’t be close to those casters. 1% Increased Haste is a decent stat for you. War Stomp stuns nearby opponents. This is an occasionally useful ability, to stun things allowing you to escape. The increased health is nice at mid-levels, but doesn’t scale well at very high levels. Still, it’s about equal to three Stam gems. 2% increase to critical effect when healing or damaging. Berserking is a good emergency ability, increasing your casting speed for a few seconds. Drop it into a macro with any other burst abilities you want to fire off at the same time. Increased XP Vs Beasts is nice for leveling. Ranged expertise has zero value for you. Undead: You’re Undead because the Gods didn’t want you and now you’re a Priest? Will of the Forsaken is a very nice PvP ability, but you’ll only find occasional use for it elsewhere. Touch of the Grave drains life and heals you for the same amount. This means that your name will appear on the DPS charts, but not much more. Worgen might be “the best” due to their +1% Crit and their sprint. +1 to Hit racial is not an important stat for you, though Shadow would like it. Your Stoneform washes away bleeds and reduces damage, which will only be rarely useful to you. Expertise with Maces would be nice if you had any use for the things. Human: You look good in the right armor. Expertise with Sword/Mace might have some end-game value, if you had any use for Swords or Maces. Expertise with daggers and small swords is good for Rogues, but not for you. 2% increased dodge is nice while tanking, but healers will have little use for it. Increased crit chance is an Ok stat. Both of these videos are old, but are kept here for the “How to” discussion. A discussion of the D Priest in 5.3, including the changes brought about in 5.3. He discusses glyphs, gear, talents, stats. gems, and some good tips. Kinda laid back and a bit rambling, but plenty of good stuff. He shows you what NOT to do, as well. He doesn’t care for atonement healing and wil show you what works better. Priest leveling is easy, especially for Shadow. Holy and Disc. can level in PvP or Dungeons and Shadow can do all of that and quest effectively. Then you hit the tops and the game changes. And then you have those other alts you want to level though those 90 levels. I don’t understand your question. Spirit Shell is insta-cast with a one minute cooldown. If you know the fights well then you can anticipate the imcomming damage. sorry if I wasn’t clear, just looked like u casted spirit shell on one guy for the entir grp and at same time casting POH, just trying to improve my healing skills. so I didn’t know if it was a macro or something else. Divine Aegis doesn’t just come from prayer of healing. It actually procs on critical heals. Instead of healing 200%, you get 100% heal and a 100% shield. High crit disc priests are a viable build. I want to ask what heirlooms i should get? I am currently lvl 20. These increase your XP gain and don’t require Justice Points. You just need gold & Guild rep to get these. It’s really up to you whether you complete the armor set or get the weapon first. The weapon will increase both your healing and damage, while the armor will give you bonus XP.